But there are wider ramifications to be considered if Gandhi chooses to indeed fight from Wayanad. For one, his principal opponent in the constituency is not the BJP, but the CPI, which is part of the Left Democratic Front (LDF) in the state. Rumours continue to swirl feverishly around the question of Congress president Rahul Gandhi choosing a second seat, apart from Amethi in Uttar Pradesh, to contest from in the upcoming parliamentary elections. For the past week, Wayanad in Kerala, surprisingly, has been at the top of that list of alternate seats for Gandhi to fight, ostensibly through frantic lobbying by a section of the party leadership in the state. In fact, it is the only parliamentary seat in the state for which candidature has been left wide open by the party ahead of the April 23 polls. Wayanad, a constituency in north Kerala formed post delimitation in 2009, encompassing a large share of tribal population, is touted to be a seat where the Congress enjoys wide support. In the two Lok Sabha elections that the seat has seen so far, MI Shanavas, who passed away last year, won both times for the Congress even though his margin of victory came down drastically in 2014. Congress’ hopes of victory in the seat also hinge on the fact that two of the seven Assembly segments – Thiruvambady and Ernad – are considered fortresses of its ally, the Indian Union Muslim League (IUML). So, in all respects, if Gandhi chooses to fight from Wayanad, arithmetically, he faces no dangers of a defeat. The perception within party circles is that his candidature from Kerala, which would be the first for a member of the Nehru-Gandhi family, would boost the party machinery in the state and across all southern states. After all, a good showing in the south is essential to the party’s prospects of forming a government in Delhi. Also, for Congress, Kerala has always been an important state, and its state leadership has stuck with the party through good times and bad. The longtime presence of former defence minister AK Antony and the recent elevation of KC Venugopal as the general secretary (organisation) within the coteries of Sonia and Rahul Gandhi are cases in point. But there are wider ramifications to be considered if Gandhi chooses to indeed fight from Wayanad. For one, his principal opponent in the constituency is not the BJP, but the CPI, which is part of the Left Democratic Front (LDF) in the state. In 2009 and 2014 Lok Sabha polls, the LDF candidate polled 42.31% and 38.9% respectively, coming second to Congress’s MI Shanavas. In contrast, the BJP, which wields little clout in the seat, got less than 10% votes both times and is seen as a nobody there. Kerala Chief Minister Pinarayi Vijayan last week was among the first to question the candidature of Gandhi from Wayanad. Known for his restrained and guarded comments on any issue, Vijayan was however surprisingly blunt on the matter. “Congress needs to think what message they are trying to send out to the nation…Gandhi is not coming to fight the BJP here, but the LDF,” Vijayan told reporters in Kannur. Secondly, bringing Gandhi to Wayanad is seen as a wider plot resulting from the mad pulls and pressures of factional politics within the Congress in Kerala. The party is still essentially split between the ‘A’ group led by former CM Oommen Chandy and the grand ‘I’ group piloted by the leader of opposition Ramesh Chennithala. In fact, the story goes that ticket distribution of the party predominantly depends not on finding winnable candidates, but on determining which seat each faction ultimately gets. If Gandhi shies away from contesting, the ticket will go to T Siddique, who is seen as close to Chandy. He added that there was no question of LDF withdrawing it’s candidate so as to give Gandhi a walkover. “We have already finished our first round of campaigning through all 50 panchayats. We will go ahead with our campaign,” he said. It’s common knowledge that the Congress and the CPM harbour no love for each other in Kerala. In a state with bipolar politics, they face no imminent danger from the BJP except in one or two seats. But it deserves to be noted that in the 2004 parliamentary polls, it was the Left that came to the rescue of the Congress in forming a government in Delhi when both the Congress and the BJP fell woefully short of a majority. It was also the first time that the Congress was routed in Kerala with not a single MP getting elected from the state. So with such memorable history behind it, what sort of message would Gandhi want to send nationwide by fighting an election opposing a party that’s open to supporting it in Delhi? Local politics notwithstanding, experts wonder whether it would be far more prudent for him to fight, for example, from a seat in Karnataka where he will be seen as taking on the BJP. 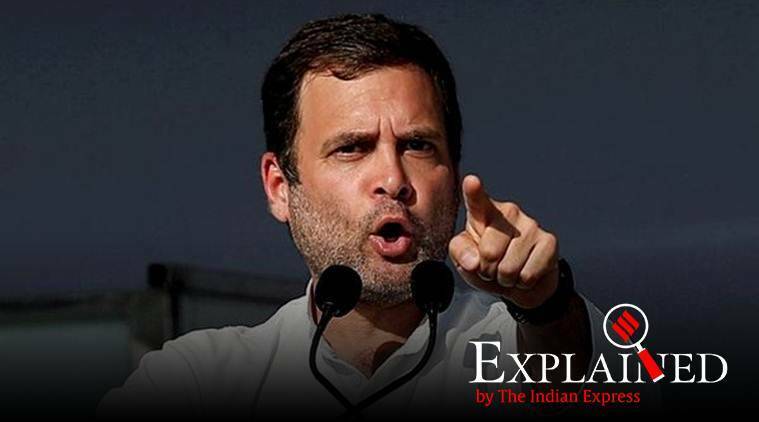 Don’t miss in Explained: What is Rahul Gandhi’s minimum income scheme? Who will benefit? 1 Explained: What is Rahul Gandhi's minimum income scheme? Who will benefit? 2 Explained: What is the Pollachi sexual abuse case?